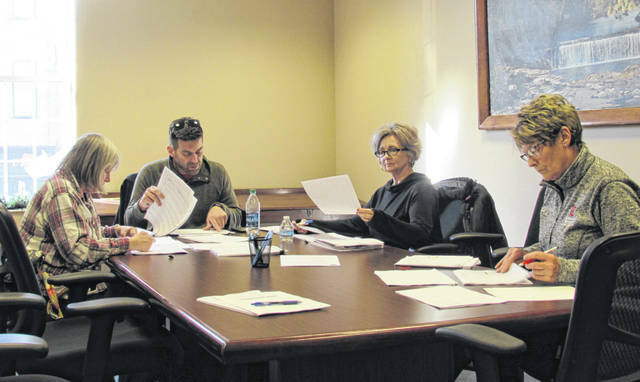 Shown, from left, are Councilwoman Wendy Culbreath, Finance Committee Chairman Justin Harsha, and committee members Ann Morris and Mary Stanforth. A full General Fund budget for the City of Hillsboro on Friday got the go-ahead from Hillsboro City Council’s Finance Committee, and council will likely vote for approval at its monthly meeting Monday. The committee first voted on Tuesday to recommend a full budget draft, but met again on Friday to amend its recommendation after city staff made thousands of dollars in cuts. Chairman Justin Harsha said this week’s cuts to the proposed $5.1-million General Fund budget took the city’s projected carryover from $2,800 to $215,329. One of the largest cuts this week, according to Harsha, was a yearly appropriation of $130,000 set aside to pay off bonds on the North East Street fire station. But with a three-year contract and purchase agreement pending with the Paint Creek Joint EMS/Fire District, Harsha said the city does not need to account for that cost. Other cuts included sidewalk replacement and new street lights for North High Street. As previously reported, city council in December approved a temporary budget to cover the first quarter of the year until the city could strike a deal with Paint Creek for fire/EMS coverage and the sale of the North East Street fire station, which Paint Creek currently occupies. While Hillsboro Safety and Service Director Mel McKenzie on Friday confirmed that a final deal has not been signed, an informal agreement is currently being reviewed by lawyers and is expected to be approved soon. Under the agreement, the fire house the city currently owns on North East Street will sell to Paint Creek for $720,000, and in exchange, Hillsboro will take ownership of Paint Creek’s former firehouse on Governor Trimble Place. As previously reported, the proposed agreement says Paint Creek will pay $5,000 per month in rent for the fire station that will be counted toward the purchase price until the deed can be transferred. In turn, the city will pay Paint Creek $650,000 over each of the next three years, then will become a member of the district at that time. A problem with the North East Street station’s deed threw a wrench in ongoing negotiations for the property sale, and when the city took the property off the market in an apparent bargaining move, Paint Creek withdrew a standing offer for Hillsboro to join the district as a member, demanding that Hillsboro sell it the property. So, while Hillsboro City Council voted unanimously last month to join the district, both parties found themselves at an impasse pending a resolution to real estate negotiations. Mayor Drew Hastings said the $650,000 annual payments are “actually pretty darn close to the millage equivalent” Hillsboro residents will be asked to pay when, and if, the city actually becomes a member of the district. Hillsboro was paying the district roughly $570,000 per year for fire coverage before that contract expired at the end of last year. If Hillsboro joins the district, a 5.5-mill property tax will automatically be put in place. According to Highland County Auditor Bill Fawley, agricultural and residential properties would pay the equivalent of 4.8 mills, and the estimated yearly tax is $151.20 per $100,000 of valuation.